MERCATOR, G./ HONDIUS, J. - Africa ex magna orbis terre descriptione Gerardi Mercator. . .
Africa ex magna orbis terre descriptione Gerardi Mercator. . . - MERCATOR, G./ HONDIUS, J. Size : 14.9 x 18.5 inches. / 37.8 x 47.0 cm. 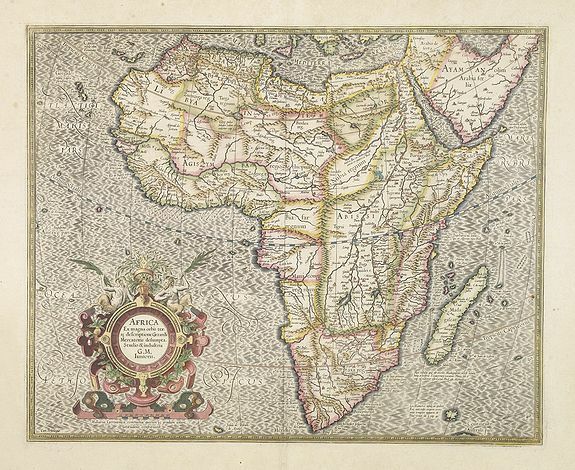 Description :Map of Africa, based on Gerard Mercator's twenty-one sheet wall map of the World, first published in 1569. Much of the interior of Africa defers to the traditions of Ptolemy, the Nile river is shown with the two lakes and the Mountains of the Moon across southern Africa. A seated legendary priest-king Prester John is shown in Ethiopia. Portogal (the Portuguese Fort) is placed on the map within the junction of the Spirito and Cuama rivers. Condition : A good and strong impression. In mint condition. The cartouche is highlighted with gold dots !